Mrs. Bradley, Paul Mobius. 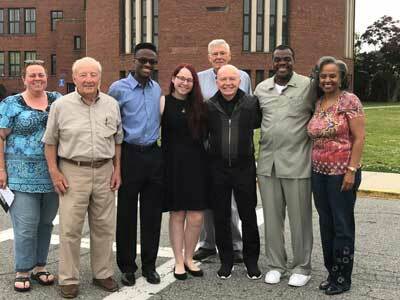 Immanuel Mellis, Helena Bradley, Lance Blackshaw, Mark Mobius, and Mr. and Mrs. Mellis in the Mepham parking lot following Mepham tour. 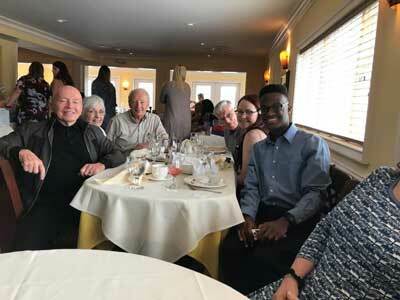 ON SATURDAY JUNE 17, 2017, Mark and Paul Mobius, Paul's wife Dorothy Forster (Mepham '53), 2017 Mobius Arts Scholarship winners Helena Bradley and Immanuel Mellis, and I attended a luncheon hosted by Mark at the Villa D'Aqua in Bellmore. 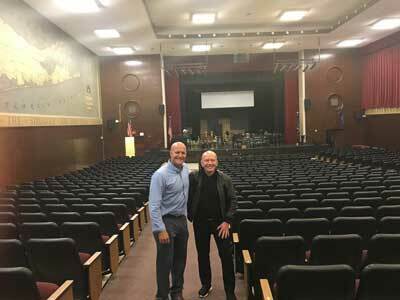 Following the lunch, Principal Mike Harrington and Mepham Alumni Association President Carol Kilgallin (Mepham '72) graciously made themselves available to lead us on a tour of Mepham. It was great that Mark found the time to do this, meet the awardees, and become reacquainted with today's Mepham....so many years after our 1954 graduation. Here are five photos of the occasion. Mark, Dorothy, Paul, Lance, Helen and Immanuel Principal Mike Harrington and Mark in Mepham Auditorium. 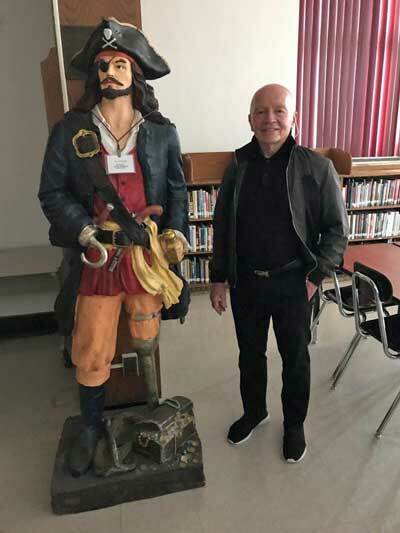 Mark with the pirate statue in the Library. 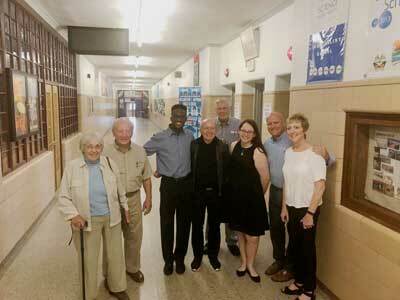 Dorothy Forster Mobius, Paul Mobius, Immanuel Mellis, Mark Mobius, Lance Blackshaw, Helena Bradley, Principal Mike Harrington, and Carol Kilgallin outside the high school main office.